Laplink PCmover Ultimate is the fastest way to transfer everything from an old Windows PC to a new one. Install PCmover on both systems and choose which applications, documents, user profiles, and settings to take with you to your new Windows PC. 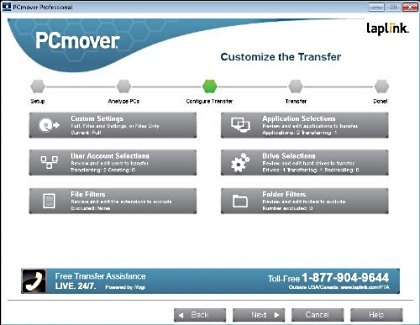 If your computer has multiple users, PCmover Ultimate gives you the option to transfer some or all of the users. The security information about file ownership and access control is preserved for each user post-transfer. PCmover Ultimate makes the process of setting up a new Windows PC simple, using a step-by-step wizard process. PCmover was built to eliminate the traditional rituals that come with the purchase of a new PC. It offers a "hands off" solution that allows users to recreate their old computer's personality and functionality on their new PC in a few clicks. Users experience minimal downtime during setup, and save on the cost of purchasing programs again. • Laplink PCmover Ultimate is the ONLY migration solution Microsoft recommends. Quickly set up your new Windows device with the help of a certified PC migration expert, over the phone or through a remote desktop arrangement. Common questions include how applications are transferred to your new Windows PC. Applications can be accessed by clicking on the application's "tile" on the Windows Start screen. (To access the Start screen from the Desktop, move your mouse to the lower-left corner of the Desktop, and click on the Start icon that appears.) Once on the Start screen, scroll to the right to find your applications, which will be listed as individual "tiles". To perform a PCmover transfer, install and run PCmover on your old PC first. Complete the steps in the PCmover screens as directed. Then, when instructed to do so by PCmover, install and run PCmover on the new PC. Complete the steps in the screens to prepare your new PC and finish the transfer. Consult the User Guide for detailed troubleshooting.